With PersonalizedThings by Exposures, you can be part of the team! 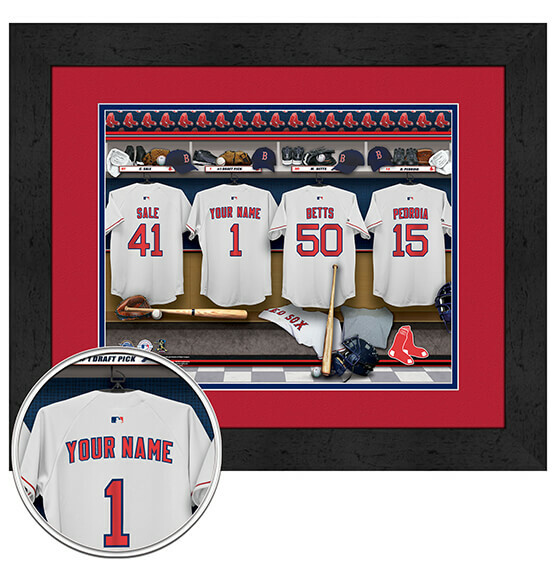 Easily customize this print with a first name, last name or nickname — up to 12 letters — on the back of a locker room jersey next to other BoSox team greats with our fantastic Boston Red Sox Custom Locker Room MLB Framed Art. Great for the die-hard Boston Red Sox baseball fan, this premium print is double matted in Red Sox team colors and set inside a sleek, black frame. Whether you purchase this high-quality personalized artwork for yourself or as a thoughtful gift, it is guaranteed to be a conversation starter to cherish for years.